This will be the third country-wide strike since Modi came to power and promises to be the biggest, with rural workers also joining in. Preparations are on across the country for what could well be one of the biggest strike actions India has seen. At the call of a joint platform of 10 central trade unions and dozens of independent federations, workers and employees in all industrial sectors, across units of all sizes and even in services sector and government employees will go on a two-day strike on January 8-9, 2018 to press for their 12-point demand charter. Various farmers and agricultural labour unions have extended support to the call, escalating the sweep and depth of the strike action to unprecedented levels. Except the Rashtriya Swayamsevak Sangh-affiliated Bharatiya Mazdoor Sangh (BMS), the strike call is supported by all central trade unions – Centre of Indian Trade Unions (CITU), All India Central Council of Trade Unions, All India Trade Union Congress, Indian National Trade Union Congress, Hind Mazdoor Sabha, All India United Trade Union Centre, Trade Union Coordination Centra, Self Employed Women’s Association, Labour Progressive Front and United Trade Union Congress. This is for the second time that a two-day strike will be observed, the first being in 2013, during the United Progressive Alliance -2 regime. Also, this is the fifth strike by the joint platform of central trade unions, which earlier included the BMS, too. However, since the Narendra Modi-led government came to power in 2014, BMS has been back-pedalling, and trying to disrupt the unity of trade unions by charting a placatory path even though conditions of workers deteriorated under Modi. The key demands of the workers include curbing rising prices of essential commodities, creation of new decent jobs, minimum wages Rs.18,000 per month and minimum Rs 6,000 a month, pension to all, stoppage of all moves to sell public sector undertakings’ (PSU) shares and outright privatisation through various routes, universal social security coverage to all, strict enforcement of labour laws and end to their dilution, end to contractualisation, etc. The demands have met with stony silence on the part of the Modi government throughout its near five-year reign. In other words – there is a complete deadlock between workers and the government. The Modi era has seen a relentless attack on the lives and livelihoods of working people both in non-farm and farm sectors. This period has seen rising prices, stagnant wages, galloping joblessness, persistent attempts to introduce hire and fire and destroy protective labour laws and record-breaking privatisation of public sector. This obstinacy of the government has helped boost corporate profits even though the economy has been passing through difficult times, with investment and credit flows slowing down, flagging demand and low capacity utilisation. The twin disasters of demonetisation and Goods and Services Tax (GST) roll-out have devastated the smaller industries and informal sector, with lakhs of jobs lost and small manufacturers and retailers ruined. Workers’ lives have been further affected by rising prices of not only essential commodities like food and cooking fuel, but also by increased cost of education and healthcare. This also is a direct result of Modi’s policies of privatisation of essential services and funds crunch on welfare schemes. The attack on workers has been matched by a similar all round immiserisation of farmers and agricultural workers. Due to its commitment to neo-liberal dogma and World Trade Organisation norms, the Modi government has refused to spend more on agriculture by giving better procurement prices to farmers, although it had promised to do so in the election campaign for 2014 elections. As a result, farmers are not getting due prices for their produce, throwing them into a vicious cycle of debt which ultimately leads to migration, unemployment and suicides. The farm crisis contributes to creating a standing army of unemployed which helps in keeping industrial wages low. Agricultural workers’ wages have been stagnating in inflation-adjusted terms thus ensuring that this large segment of working people – some 15 crore – remain shackled to extreme poverty and feudal oppression. The Modi reign has also been marked by almost continuous struggles by working people in both industrial employment and in agriculture. In 2015, the first of the one-day country-wide strikes against Modi’s rule was observed on September 2. This was followed by another one-day strike in 2016. 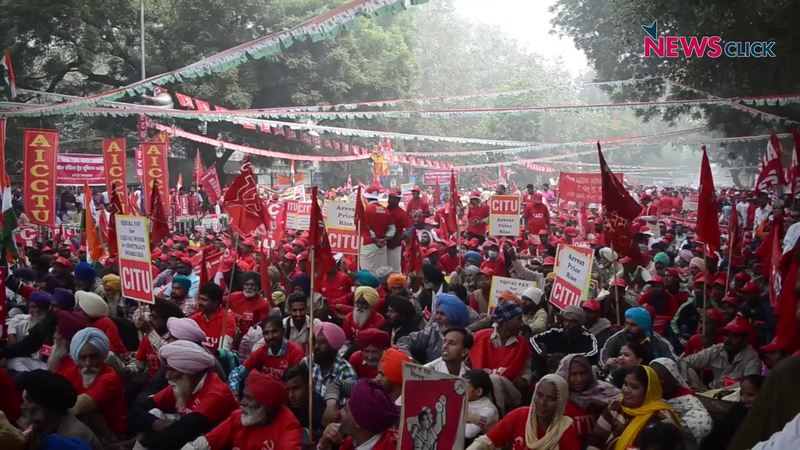 In 2017, a three-day Mahapadav of workers was organised in Delhi to press for the same demands in which over two lakh workers joined in from all over the country. In August 2018, workers joined farmers for a jail bharo agitation and nearly five lakh people courted arrest in 394 districts of the country. This was followed by a historic march to Parliament on September 5, jointly called by trade unions and farmers and farm workers unions. “Apart from these coordinated country-wide protest actions, the Modi era has been marked by protest actions and strikes in almost all major industrial sectors including services and govt. employees. Ever new sections have been drawn into these battles, protesting on sector-specific issues,” explained Tapan Sen, general secretary of CITU, speaking to Newsclick. “These sectoral struggles coalesce and lend a huge momentum to the forthcoming two-day strike”, he added. Scheme Workers: Various government schemes (like Integrated Child Development Scheme, mid-day meals, National Health Mission, etc.) employ nearly one crore workers, mostly women, who are treated as part-time workers with very low wages and no legal benefits. They fought pitched battles in several states like Karnataka, Andhra Pradesh, Telangana, Himachal Pradesh, Uttar Pradesh, Bihar, Haryana, Punjab, etc. In January 2018, they even observed a one-day country-wide strike. Coal: Workers in coal mines threatened to go on strike against privatisation several times forcing the government to back down. Steel: Besides continuous struggles for better working conditions and wages, steel workers fought against privatisation of steel plants and went on strike in Salem, Durgapur and Bhadravati. Transport: Workers of the massive transport sector observed a one-day strike and repeated mass protests against the new law allowing entry to big private corporations in the sector and for better working conditions. Telecom: Workers in the state-owned BSNL went on strike twice, including a two-day strike, to protest against privatisation of this important telecom giant. Electricity: In several states, employees of state electricity boards held numerous and sustained agitations against attempts to privatise electricity distribution. Significant victories were registered in UP and Haryana, where the BJP state govts. were forced to back down. Defence: Employees of defence production units held a 40-day dharna and numerous protests against the selling off of these units to private corporate entities. Plantation: Workers in tea plantations went on strike in Assam in 2016 and then in West Bengal they observed a two-day strike to demand better wages and social security. Automobile: Privately owned automobile and parts manufacturing units have seen a wave of protests in Tamil Nadu and Karnataka, including in Yamaha, Royal Enfield, MSI, suppliers of Toyota etc. on issues relating to wages, victimisation and retrenchments. Bank, Insurance: Bank employees have gone on strike three times in the past four years, including one two-day strike, demanding end to policies of privatisation and mergers, and better working conditions. Insurance sector employees have been in the thick of struggles throughout this period. Medical Representatives: The vast sales force of pharma companies have observed a one-day strike to press for better wages and working conditions. This saga of continuous and ever-growing industrial protests has convinced the trade unions and lakhs of workers that the only solution now is for Modi government to be voted out of power in the general elections due in a few months. “The record of Modi in dealing with problems of workers is so dismal, his government’s attitude so biased and hostile, so openly pro-industrialist anti-worker, that workers hope to get relief only if his government is thrown out and a more responsive government takes over,” says Sen. The coming strike is thus not only about workers’ immediate demands: it is also about ensuring a future of dignity and better, more decent life. The strike is preparation for the electoral battle that is round the corner.